Blocktrade.com, the first to be fully MiFID II regulated crypto asset exchange and GoSecurity, the end-to-end platform for issuing and managing security tokens have recognised their common vision of the future of financial markets and signed an agreement on mutual cooperation. 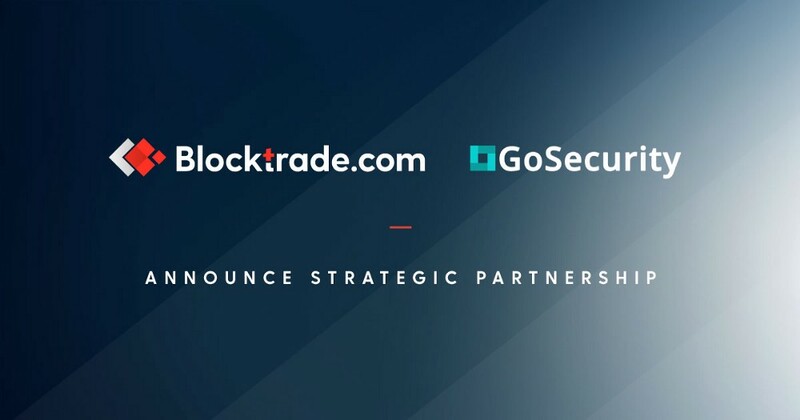 The agreement represents the foundation for an ecosystem where GoSecurity will help perform the primary issuance of tokenized securities with its partners for its customers and offer them listing on Blocktrade’s trading facility. Blocktrade will provide GoSecurity, its partners and customers the access to a multilateral trading facility/platform, which will offer listing and trading of blockchain security tokens and other financial instruments. Both companies give great emphasis on regulation and compliance and will therefore build the ecosystem accordingly — restoring trust and confidence in the financial markets of the future. Claus Skaaning, GoSecurity CEO welcomes the partnership: This partnership is of great importance to us in GoSecurity in order to provide our clients with liquidity for their tokenized securities. Blocktrade is viewed as a leader in this space and we are proud to enter into this partnership agreement. “It is of utmost importance to us that the future of finance develops in a regulated manner. We believe that security tokens will be representing a significant amount of the liquid assets of the future and are warmly welcoming GoSecurity in the ecosystem we are building. As we share common values and vision, we will be making financial markets fairer for everyone,” states Luka Gubo, CEO of Blocktrade.com. GoSecurity provides consultancy and software related to the issuance of tokenized securities. We are focused on furthering the ecosystem of tokenized securities and providing efficient and cost effective solutions to companies desiring to raise funding through the issuance of tokenized securities representing either equity, bonds or assets. We are building a network of partners in Europe and the US to enable an end-to-end solution to our clients. GoSecurity organizes the event Fintech Disruption Summit (http://www.fintechdisrupt.dk), the leading event in the Nordics concerned with blockchain technology in the financial industry. Blocktrade.com is a top-tier trading facility for Security Tokens, Crypto Assets, Crypto Traded Indices™ and other tokenised assets. With a clear vision of establishing the New financial world ecosystem, they are about to become the first fully MiFID II compliant crypto exchange and are partnering with security token issuers, market makers and other financial institutions, sharing the same high standards and values. Acquiring the license for listing security tokens in a completely regulated manner, Blocktrade.com is opening the floodgates for institutional capital to join the crypto markets. In order to exceed expectations of retail as well as institutional traders, Blocktrade.com trading venue is built on high performance, superior security and outstanding customer experience.